Children will experience a sense of accomplishment when they climb to the top of Burke's new Alpine Climber. With multiple climbing experiences using the rock climber handholds and the net wall, kids will enjoy tons of awesome play on this new freestanding climber. Start designing with this innovative and exclusive new Alpine Climber from Burke. Secure bicycle parking is a necessity for any public area. You need bike rack designs to fit the bikes, the landscape and your budget. Pilot Rock brand bike racks come in many different styles, to park from one to 20 bikes. Bike rack finishes include the durable hot dip galvanized or the colorful powder coat paint. Because the racks include heavy gauge steel and welded construction, they are resistant to use and abuse. Café Umbrellas by Shade Systems are the perfect shade solution for your municipal pool, concession or water play areas to provide cooling shade exactly where you need it. Available as a permanent mount or with portable base for maximum flexibility, these sturdy, collapsible umbrellas are available in 10-by-10-foot square or 14-foot diameter hexagon models. Choose from a wide array of colors. Umbrellas come mostly pre-assembled so there is virtually no installation expense. 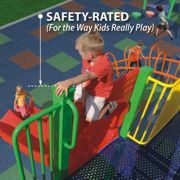 SofTILE is an exceptionally durable playground surfacing system that locks in place, is vandal-resistant, fade-resistant and class A fire-rated. Most importantly, SofTILE outperforms all competing products in safety performance. SofTILE carries the industry's only 10-year warranty including compliance with fall protection standards. The success of the SofTILE brand has been rooted in its ability to offer lower cost of ownership, by offering a truly maintenance-free solution. 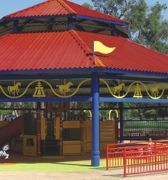 Site & Park Amenities LLC creates custom-designed shelters, engineered for premier strength and stability with ease of installation. Personalized consultation provided at no cost. Dog parks generate more outdoor recreation for the investment than almost any other activity in your parks. 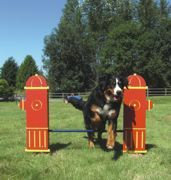 Why not make your dog park more of a destination with agility equipment and site furniture from Dog-ON-It-Parks? Choose from more than a dozen innovative dog park exercise components, and a wide variety of specialized dog park furnishings like fire hydrants, benches, dog drinking fountains, pickup bag dispensers and more. Wibit Sports has developed a complete line of interlocking modular inflatables that are configurable in any layout, allowing you to create the activities and games of your choosing so they meet your customer's interests and your facility's needs. Be inspired by the uniqueness of Wibit products to create an unlimited number of Aquagames your guests have never experienced before and bring fun, excitement and friendly competition to the water. Wibit inflatables are made of commercial-grade, seamed welded 32-ounce PVC and do not require continuous air flow. Poligon has created one of its largest shelters in Clermont, Fla., spanning 90 feet. This custom-designed dodecagon with side wall and stage provides covered seating for 400 people. Along with the architectural company GatorSktch, Poligon designed and engineered this structure to meet Clermont's needs and stayed within budget. The steel frame is powder-coated with Poligon's proprietary Poli-5000 super-durable TGIC system and the mega-rib roof is protected with a long-lasting Kynar-500 finish.